Using data-driven methods to understand business and the economy. 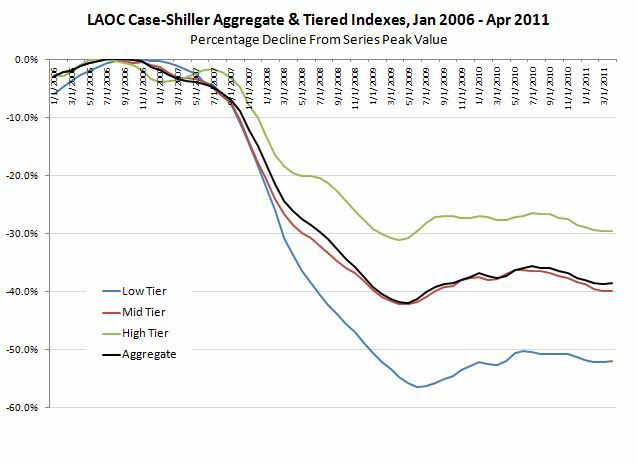 The good folks at Standard & Poors have released the S&P Case-Shiller indexes for April 2011. As usual, our focus here at Global Decision is our local market of LAOC (Los Angeles / Orange County). Let’s start with an overview of what’s happened since Jan 2000. 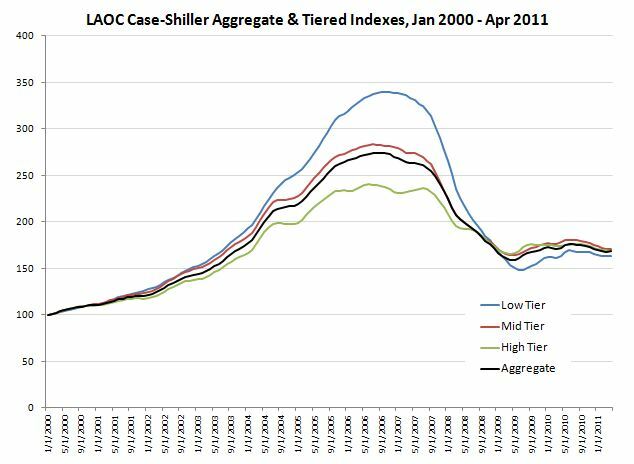 As you can see from the 11+ year trend, LAOC housing experienced a major bubble which is still unwinding. No news there. It’s much more interesting to look at just the more recent history of the price trends. To that end, we present two additional charts. First, let’s review what’s happened since 2006 (post-bubble). The following chart presents the percent decline from the peak value for each series. The above chart captures a few interesting effects. First, it’s clear that lower-end housing has fallen in value much more than higher-end housing. This fact dovetails nicely with the data presented in the first chart. In relative (percentage) terms, the housing bubble was greatest in size in the lower-tier markets. Those markets thus had the most unsustainable gains to unwind — and unwind they have. The real question now on everyone’s mind is “Where do we go from here?” To help gain insight into that admittedly difficult question, let’s look at even more recent Case-Shiller data. The data since 2009 show the impact of attempts to steer the housing market. 2009 and 2010 saw the implementation of various state and local tax credits that effectively increased the market value of homes sold while the credits were in play. As with any unsustainable outside influence on a market, as soon as the credits expire, economic theory would hold that a new equilibrium would form at a new lower market-clearing price. The chart shows that the theoretically-expected result is largely coming true. Prices for all three tiers have been in decline since mid 2010 (the Federal tax credit ended June 30, 2010). In addition, we see that the bump in prices that was engineered by these credits was a larger percentage on lower-tier homes. This also follows logically: if I’m “giving” you $8,000 to buy a home, that’s significant on a $150,000 home. On a $800,000 home, not so much. Given that there has been minimal job and income growth in the economy since the prior low in early 2009, it stands to reason that all three tiers will soon revert to their pre-tax-credit values. It’s less clear what will happen once we revert to pre-tax-credit values. Will the indexes “bottom out” or drop another 5-10% as many economists predict. 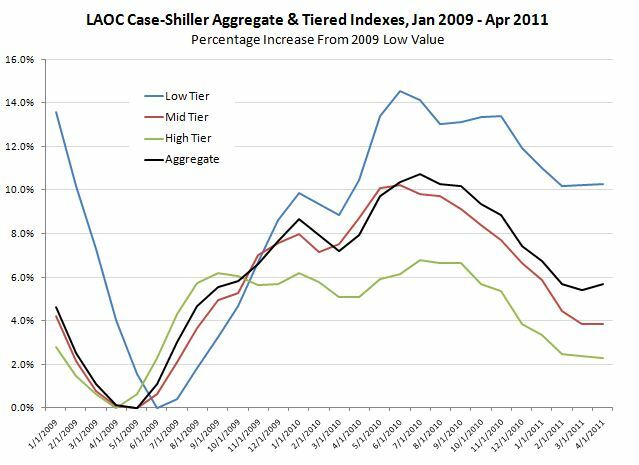 This entry was posted in real estate analytics and tagged April 2011, Case-Shiller, double dip, home values, LAOC, Los Angeles, Orange County. Bookmark the permalink. Very interesting. So if the lower end of the market has dropped more — does that mean that the higher end is yet to fully fall to market value? I don’t think the high end will ever fall to market value but it will definitely drop. Thanks for the graphs. Irvine condos rent versus own by Global Decision and IHB » OC Housing News on Is owning a home riskier than renting?